So this whole “caramel is delicious!” thing that everyone — including me, I guess — is always talking about, well, I get it now. And not just in the theoretical sense of sugar plus butter plus cream must equal something delicious (synergy!). Am I ready to start popping homemade chewy caramels like nobody’s business? Nope. (A good thing since I managed to ruin two batches of what I’d previously considered a no-fail recipe this holiday season, deciding that they just weren’t meant to be.) But bring on the caramel drizzle! That’s as good a place as any to begin. 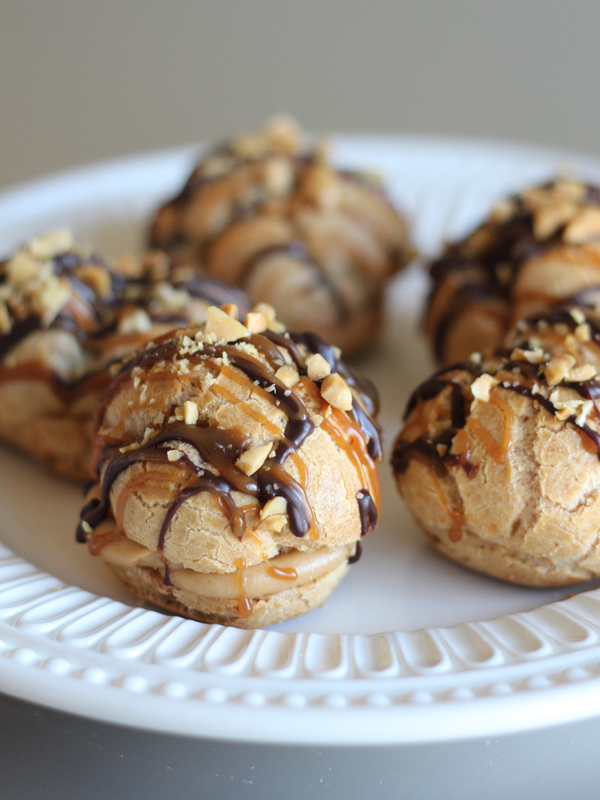 Fans of Snickers or their elements — chocolate, peanut, caramel — probably don’t need much convincing that these eclairs are to die for, but let me prattle on just a bit longer. We kick thing off with — you guessed it — the caramel. This tasty sauce comes into play in two ways. 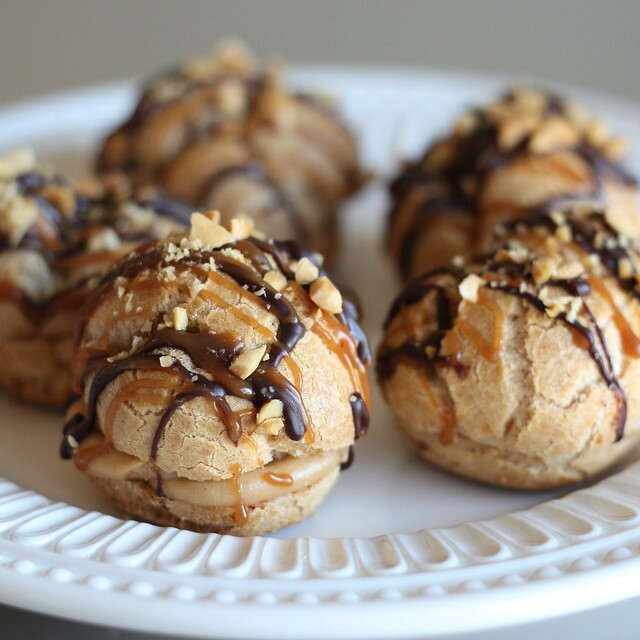 It’s not only one of the finishing touches shown front and center atop the assembled eclairs, but it’s also mixed into the fluffy peanut butter filling, adding a subtle toasty note from the inside. In other words, important stuff. The usual, adapted-from-a-children’s-cookbook pâte à choux recipe makes another appearance — you may remember it from such hits as cream puffs and the perennial classic, éclair bites with vanilla bean pastry cream and salted bittersweet chocolate ganache. And speaking of ganache, it strikes again in tandem with the aforementioned caramel and a handful of chopped peanuts to bring us on home. So tell me, are you a longtime fan of caramel or just beginning to see the allure like me? Let’s talk in the comments or on Facebook or Twitter! Feel free to double everything, but be sure to rotate the baking sheets for the pâte à choux about half way through. Place sugar in a small pan (2-quart) over medium heat; swirling pan only on occasion, cook sugar until melted and golden brown. Whisk in butter until melted and smooth. Slowly whisk in heavy cream, bring to a simmer; cook, whisking occasionally, until very bubbly and syrupy (about 5 minutes). Remove pan from heat and whisk in extract (it’ll bubble a lot!). Transfer caramel sauce to a heatproof jar. In the bowl of a stand mixer fitted with the paddle attachment, combine cream cheese and peanut butter; beat on medium until smooth, scraping down bowl as needed (about 2 minutes). Add cooled caramel sauce, and mix until combined (about 1 minute). Mix in powdered sugar, scraping down bowl as needed; beat for about 2 minutes or until sugar is dissolved and filling is somewhat fluffy. Transfer to a bowl, cover with plastic wrap and refrigerate until ready to use. Break one of the eggs into the paste, beat on medium-high speed (with the paddle attachment) until it’s smooth and kind of sticky looking (takes a couple minutes). Scrape down bowl, break the remaining egg into the paste, and beat again until blended, thick and sticky (this is what it should look like). Spoon small, level cookie scoops (1 tablespoon) of paste onto prepared pan, spaced about 1 1/2 inches apart. Place pan in oven and bake at 375°F for 25 minutes, then reduce heat to 325°F and bake for up to 5 minutes more, or until nicely browned and somewhat dry on the inside. Remove from oven and transfer puffs to a wire cooling rack. Once cooled completely, cut each — a serrated knife works well — in about half (or 1/3 bottom, 2/3 top) and proceed to filling. Top each with the other half of shell, pressing gently to adhere. Place filled eclairs on a serving plate or cooling rack with a cookie sheet underneath (to catch ganache and caramel drips later). Place in the fridge for about 30 minutes (or cover loosely with plastic wrap and refrigerate longer) to allow filling to firm up a bit. Make ganache: In a small saucepan, warm cream over medium-low heat, stirring occasionally, just until you see a bubble come to the surface. While cream is heating up, place chocolate in a heatproof bowl. Pour hot cream over chocolate and let it sit for a minute; gently stir until the chocolate is melted and the mixture is smooth. Reheat caramel: While making ganache, warm remaining caramel sauce in a separate small pan over low heat just until it begins to bubble; remove from heat. Grand finale: Drizzle the ganache and caramel sauce over eclairs. Immediately top with chopped peanuts. Serve once ganache and caramel have firmed up a bit (just a few minutes). To store: place eclairs uncovered in the fridge, allowing the caramel and ganache to firm up before covering loosely with plastic wrap. At this point, they may also be wrapped in plastic, transferred to freezer bags and frozen; defrost, unwrapped, at room temperature before enjoying. Holy moly, these look awesome! And your pate a choux looks perfect. So impressed that these are gluten-free! Thank you for sharing this beautiful recipe.